Huzzah! 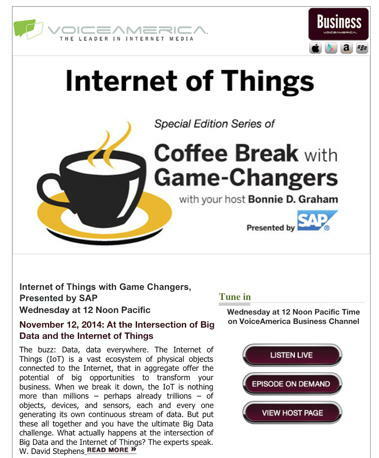 I’ll be a guest on Bonnie Graham’s “Coffee Break With Game Changers” show live, today @ 3 PM to discuss the Internet of Things. 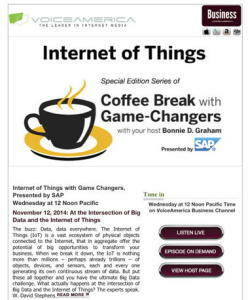 Other guests will include David Jonker, sr. director of Big Data Initiatives at SAP, and Ira Berk, vice-president of Solutions Go-to-market at SAP, who has global responsibility for the IoT infrastructure and middleware portfolio. The “Collective Blindness” meme that I raised recently — and how the IoT removes it. The difficult shift companies will need to make from past practices, where information was a zero-sum game, where hoarding information led to profit, to one where sharing information is the key. Who else can use this information? How the IoT can bring about an unprecedented era of “Precision Manufacturing,” which will not only optimize assembly line efficiency and eliminate waste, but also integrate the supply chain and distribution network. The sheer quantity of data with the IoT threatens to overwhelm us. As much as possible, we need to migrate to “fog computing,” where as much data as possible is processed at the edge, with only the most relevant data passing to the cloud (given the SAP guys’ titles, I assume this will be of big interest to them. The rise of IFTTT.com, which means device manufacturers don’t have to come up with every great way to use their devices: use open standards, just publish the APIs to IFTTT, and let the crowd create creative “recipes” to use the devices. Safety and security aren’t the other guy’s problem: EVERY device manufacturer must build in robust security and privacy protections from the beginning. Lack of public trust can undermine everyone in the field. We can cut the cost of seniors’ care and improve their well being, through “smart aging,” which brings together Quantified Self fitness devices that improve their care and make health care a doctor-patient partnership, and “smart home” devices that automate home functions and make them easier to manage. Hope you can listen in. The show will be archived if you can’t make it for the live broadcast .